Pope Francis tells us that “to be friends with God is to pray with simplicity, like children”. The prayer of children before Eucharistic Adoration is a wonderful example of what the Holy Father intends. 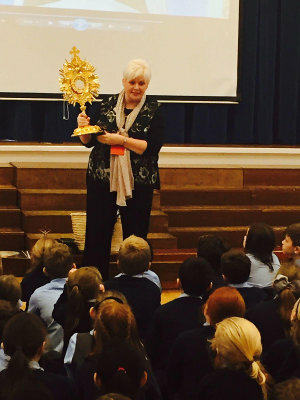 I am pleased that schools and parishes in the Diocese of Meath are providing opportunities for children’s Eucharistic Adoration through the ‘Children of the Eucharist’ programme. As we prepare for the World Meeting of Families next year, I am confident that children’s participation in this beautiful devotion will continue to provide a valuable witness to the joy of the Gospel and the sanctity of family life. What a wonderful weekend we had in Knock at the National Eucharistic Congress. There was a lovely energy about the place and even the weather smiled on us. I want to thank you and all your team for your contribution to making the Congress a success through your energetic approach and commitment to the children’s programme. From the very high numbers of children who attended, it is very clear that this type of ministry is important to the growth of their faith. I pray that our being together once again will be a source of encouragement to you as we embark together on the next stage of our pilgrim journey. In a world where children are bombarded with all sorts of challenging messages, noise, and images, it can be difficult for them to recognise God’s Presence. The Adoration for children, called ‘Children of the Eucharist’ Programme is an ideal way of helping children to know and appreciate God’s presence and of leading them in a transformative way to a personal encounter with Jesus in the Blessed Sacrament. The Apostolate of Eucharistic Adoration is pleased and proud to see this initiative spreading rapidly throughout the country and beyond. May the Eucharistic Lord continue to bless this programme and all who present it as well as the children and their parents and teachers”. This ministry brings children face to face with Jesus. It was a deep and powerful experience even for the youngest. Watching the COTE team in action reminded us all – parents, teachers and youth workers – that Jesus said, ‘Let the children come to me and do not stop them, because the Kingdom of heaven belongs to such as these.’ This is a wonderful way to nurture a love for Jesus present in the Blessed Sacrament.